How much stinkin’ thinkin’ have you been up to lately? Its not easy walking the high road. But it is required if you want to heal your pain, live in joy, have harmonious relationships, achieve your heart-felt desires, or experience enlightenment. Most people live in struggle. And then they complain about it . . . Focusing on what you don’t want only causes more of the same. If you know anything about the Law of Attraction, you already know that. Instead of treating the next little disaster in your life like a horrible “bad” thing, why not look at it for what it is – a lesson. Perhaps you are in the middle of a lesson about learning to flow with life, forgiveness, being kind to others, overcoming fear, staying calm despite your circumstances, letting go of people or situations that disempower you, cause you confusion, regret, or stress. There are a lot of lessons in the classroom called earth. Every moment of every day is there for you to see who you are and what you believe. Every person you encounter has been very strategically placed in your path for you to experience something. Each one is a gift – not a curse. Life happens. Hiccups in plans happen. Relationship issues happen. People have bad days, they misinterpret the meaning behind your words, they often see life from their own perspective and it is usually not the same perspective that you hold. You can blame something or someone for all the struggles in your life – or you can simply realize that life unfolds the way that it does – perfectly. You can perceive situations as being evil and dark. Or you can choose to accept what is and respond calmly to whatever shows up in your life. I believe that all things happen for a reason. And I also believe that I am Divinely guided in every moment. I trust that when one door closes, another one will open. And the other one is always better than I could have figured out on my own. I try to look at unexpected hiccups in plans as opportunities. And I try to learn from them. What could I do differently next time? What did I learn about myself, someone else, or how life or business works by experiencing this? The bigger your dreams, the more you have to change and walk the high road. I’m not talking about just embracing new concepts with your logical mind and trying to force new habits of behavior. I’m talking about fundamental permanent shifts physically, mentally, emotionally, and spiritually. You also have to shift octaves vibrationally. If you were already the person you need to become in order to attain your desires, then those desires would already be realized. There are a few caveats to what I just said – like Divine timing and how to know if a desire is in your highest and best interest, or whether it is simply your ego’s need for recognition, approval, or something else. We’ll save those for next time . . .
P.S. One of the fastest ways to get to the root of your issues and raise your vibration is a daily practice of deep meditation. Peering Through the Veil offers insight into numerous forms of meditation and how to make each meditation deeper and more profound. In a previous column, I wrote about Harmony; this month I want to talk about Unity. Numerologically, the letters of “Unity” reduce to an 8. If you read previous articles in this series, you’ll know that Creation and Harmony both reduce to 4. The synergy of Creation and Harmony, evolve to Unity, an 8. 8 is also the number for god. The god energy 8 generates the “stuff” of Creation (a 4). For Creation to solidify there has to be Harmony (another 4). Harmony brings “things” together. Mathematically 4 (Creation) + 4 (Harmony) = 8, a return to the god energy and Unity. Unity bonds things together . . . atoms, molecules, ice cream cones, religions, gangs, relationships, corporations, countries . . . the Self and the god energy. On its side, 8 is the infinity symbol. Without Unity there can be no infinity; without infinity, there can be no Creation; without the potential of Creation, there is no harmony; without harmony, there can be no Unity. Unity progresses toward actualization as particles of energy unite into a harmonious oneness. Oneness is based on trust, i.e. combinations of energies harmonizing at the same frequency. Unity is dependent upon trust. There must be an affinity for/with the “other”. The affinity would begin in the infinity (potential…everything is something between nothing.) The “something’s’” search for similar something’s. When a connection is made they begin to blend together. They become harmonious. Over time this harmonious oneness of trust, comfort, and compatibility brings Unity. The many become the one. The two become one. The one becomes itself. If trust, comfort, and compatibility can not be established or maintained, there is no harmony and thus no Unity. (A manufacturing defect?) Sometimes when things don’t work out, like a job or a relationship, we say there was “no chemistry.” Without “chemistry” no bonding can take place. This applies to glue not adhering to a surface, quitting something the same day you start it, or kissing someone for the first time and instantly knowing there’s no chemistry. When we meet someone we feel special about, if we can’t trust them or become comfortable with them within a reasonable time, there is no compatibility and no bond can be established. There’s no bond because there is no affinity for/from the other. This same theory can be applied to all partnerships: humans, carbon dioxide, green vegetation, and oxygen; photosynthesis and light; couples; ice cream and a hot sun; downpours and clogged drainage systems. Some partnerships work and some don’t. Let me offer an example of how a something finds another something in the nothing: Imagine the origin of a dust ball. Visualize a room whose door, walls, floor, and ceiling are painted black. There are no windows in this room, only a small slit high on the wall lets in light. You enter the room and close the door, it’s pitch black. After a while, sunlight filters through the slit creating a beam of light in the darkness. In this beam of light are tens of thousands of dust particles. You may wonder where they came from or realize they were always there. You turn and leave the room and close the door. You return weeks later taking a flashlight into the room. As you open the door and shine your light into the room, you see dust balls scattered around the room. You pick one up and look at it. At first glance it appears to be grey, but upon closer observation you notice small multi-colored threads woven into the dust ball. This is an example of Unity. These “threads” could have attached themselves to any dust ball, they all chose to unify and create this specific dust ball because there was an energetic affinity. We too are composed of many threads. Our threads can be seen in our behavior patterns. If we are anxious, stressed, impatient or otherwise in fear, our threads begin to unravel. We begin to feel disconnected from the Creation energy. We have no bonds of trust. We have no sense of belonging to the “Whole.” We don’t feel Unity, we feel abandoned. This exercise is to be performed during a new moon. It is said that seeds planted at this time have a stronger constitution and produce a more abundant harvest. It is also a time for new beginnings. If we want to live in Unity with Spirit, we must first be in Harmony with ourselves. If we can be harmonious within ourselves, we will be unified as co-creators. As co-creators we work in partnership with potential and intention. Have the courage to do what you love. Unity with Spirit is living a passionate life. Follow your dreams and fulfill you life’s calling. If you’ve been reading the newsletter for awhile, you know I often talk about the subtle signals the Universe is continuously sending your way. Those signals are what prompt you to take the actions necessary to fulfill your mission and achieve your dreams. If you ask the Universe for what you want, and you don’t take the actions you are “inspired” to take, then its almost a guarantee that your dreams will not manifest. Enhancing your ability to pick up or “tune in” to the signals is, therefore, of paramount importance. I do several things that enhance my ability to receive the information, know exactly what to do, and when. Do you meditate every single day? Is your spiritual practice, your commitment to personal and spiritual growth, at the top of your list of priorities? If its not, it needs to be. It is so easy to let life pull you in a million directions and to get off track. You skip a day here and a day there. You go on vacation or on a business trip and forget entirely. Next thing you know, its been a few weeks or even months since you connected with the Source of All. Instead of beating yourself up, simply start again. Realize that you are human – and that’s O.K. We all are. The shame and blame game serves no-one – particularly you. Judgment of yourself and others is a huge hindrance to finding the “resonance” necessary to be in flow with the Universe. Anger, judgment, hatred, blame, shame, guilt, victimhood – these are all excuses for not becoming the truth of who you are – you Magnificent Self. Stick to your spiritual practice and not only will you be able to understand the messages from the Universe, but you will also be in a significantly better position to help others. Rest, exercise, eat right, drink plenty of water, have some time to yourself, enjoy a hobby. The more stress in your life, the more vital these actions become. When you are out of balance, frustrated, exhausted, or confused, it is impossible to make good decisions or “read” properly the signals the Universe sends. You can’t help another until you have helped yourself. You cannot truly love another until you have truly loved (accepted, appreciated, acknowledged) yourself. You cannot forgive another until you have forgiven yourself. The more emotionally wounded you are, the more distortions there are in what you receive. The Universe is saying one thing. But your tainted beliefs, fears, and judgments hear something else. When you work with energy through tools or assistance such as crystals, light, hands-on healing, Dancing Dolphin Energy Products, you are lifted up into a higher octave – above the trouble, struggle, and chaos that is so prevalent in the third-dimensional experience. These things help you align with the Divine. To learn more about dowsing, I have a fabulous online dowsing course with mutiple bonuses including a phone app. The more you tune in, receive clear guidance, and act in faith, even when the actions aren’t logical, the more you will experience awe-inspiring moments, synchronicity, and miracles both large and small as a natural state of affairs. Thanks for sharing Mary. Always wonderful to reaffirm a commitment. we share the same sensibility. so lovely to connect. great article. Thanks Angel. I’ve enjoyed reading your work as well. Thanks for sharing. We all fall into that trap on occasion. Never too late to stop, breathe, and take care of ourself. Thanks for stopping by and sharing your thoughts. Morning Meditation such a wonderful way to start the day. I need to get back to doing that! Thanks for the reminder. You are very welcome Tracy. I’ve been starting the day that way for so long, I can’t image doing anything else. Starting the day peaceful, uplifted, and clear makes the whole day go better. Thanks for stopping by. I was doing good for a while in meditating every day, but I got away from it, just like you said! Now it’s been a while. I think about it and say, “Maybe tomorrow. I don’t have time right now.” I have also experimented with pendulums a bit. Interesting stuff! I encourage you to “start again.” Its so easy to get caught up in the day to day little disasters and distractions. However, when you meditate routinely, your mind is much more organized and clear making prioritizing your day so much easier. Thanks for stopping by. Great Tips. I try to meditate daily. Now I just have to implement your other tips. Such a beautiful article, Takara. Since the New Year, I’ve promised to be good to myself each and every day….do something special…I call it my “me time.” Now I have a few more ideas. Thank you. This post really resonated for me, especially this line “You can’t help another until you have helped yourself”…absolutely…self care is so critical. Beautiful, beautiful post. Thanks for sharing – good reminder that being out of balance distorts the messages from the universe! Great tips…number 3 was especially notable to me as that has been a struggle at times in my life! Thank you! Used to meditate (almost) daily but I’ve started to slack with the holidays and all. Good advice perhaps to start doing it again as a resolution for 2013. Thanks for the article, Debbie! Do You Dare Live Your Dreams? You have to grow into your dreams. You can’t achieve your hopes, desires, and goals unless you are willing to take risks, be uncomfortable, learn new things, and follow your inner voice. Otherwise, you’ll just keep getting the same things you’ve already got. No one achieves their dreams without moving into what a great little book called the Frogship Perspective terms Zones Unknown. If you know what you want, then go after it with unwavering tenacity. When one door refuses to open or suddenly closes, try something else and keep your eyes open for the door that is wide open beckoning your entry. Opportunities are right in front of you all the time. You just have to grow personally and spiritually enough to “register” that they are there. 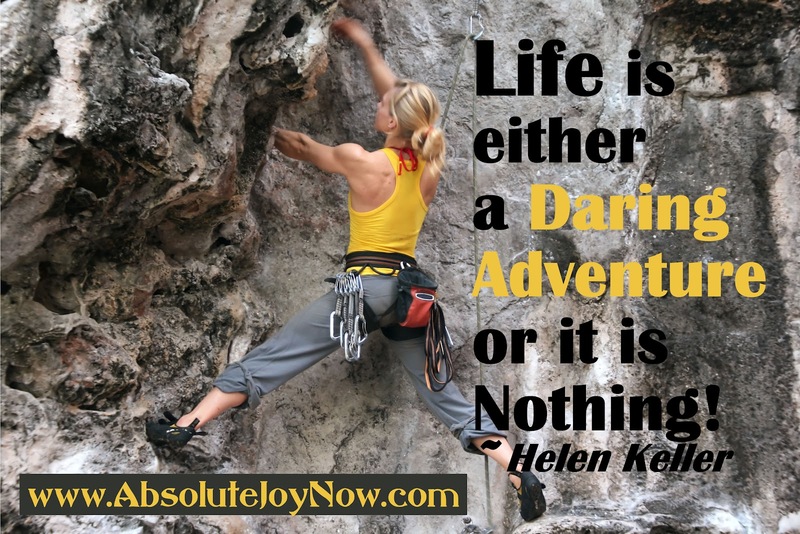 Then you have to muster up the courage to take the plunge or scale the mountain like the woman in the image. P.S. The Frogship Perspective is a gem of a book by Dean Black. Its full of sage advice with stories that bring the teaching home. I highly recommmend it. https://www.magnificentu.com/wp-content/uploads/2018/09/MagnificentU-4-1-300x70.png 0 0 Takara https://www.magnificentu.com/wp-content/uploads/2018/09/MagnificentU-4-1-300x70.png Takara2012-06-08 14:12:562015-06-06 16:58:12Do You Dare Live Your Dreams? Sometimes I feel so blessed tears well up in my eyes. The last few months have been so full of wonder that I’ve been moved to tears on more than one occasion. The story I’m about to share includes a fairly profound transformational experience. May the energy of this event touch and empower you as well. Since returning from Fiji about a year and a half ago, my life seems to be flying past at lightning speed. Days and weeks melt into one another. As I was finishing up the writing of Peering Through the Veil, I was also writing the first half of 2 of the books in the New Dance series. The first is about Awakening. The second is what I term The Platinum Principle. I know that the energy and information around this principle is one of my primary purposes for being here. Who I am and what I do requires that I continuously grow in consciousness and awareness and move ever higher in vibration, becoming more and more the voice, energy, and embodiment of the Divine Feminine. In order to do that, I often am taken through wild experiences and energetic shifts. People I don’t even know sometimes send me crystals and gems. When I was living on the yacht in Fiji, a woman I’d never heard of from Israel contacted me by email. She began sending me the most amazing dragon jade beads and other rare stones as soon as I got back to the states. I’ve created energetic elixirs with each of them. Later in the newsletter, you’ll read about what wonderful product several of them ended up in. For years I’ve been jolted awake in the middle of the night with inspiration to create something or write something down. I’ll be in the middle of working on the computer or having a conversation, and I’ll get an intuitive “hit” to google something or go somewhere. I pay attention to every one of these little “whims” that others might not even notice. Each time I follow the inspiration, and each time I invariably come across an important bit of information or I meet someone with another piece to the puzzle. Its as if every experience I’ve ever had, every bit of information I’ve learned is a thread. As I follow these intuitive promptings, the threads are being pulled together creating a beautiful tapestry. Each thing fits beautifully with everything else. Things from the past and the present that seem completely unrelated, turn out to be equally important in whatever I’m being guided to create or understand. Its a truly magical process and I’ve learned to simply trust. There is no way that I could ever figure out what’s about to happen, so I’ve stopped bothering to try. I just follow the little whims and watch in awe as things unfold. Several weeks ago I received an email from my dear Sister of the Heart, Andi Goldman. It was such an honor to have her write the forward for Peering Through the Veil. My relationship with Andi is very much like my relationship with Millie Stefani and a few others in my inner circle. It can best be described as love at first sight. Not a romantic or amorous type of love. But the kind between sisters. Yet not the kind from blood relatives, but a sisterhood that stretches back over eons. When you encounter one another there is such a love and a recognition of “knowing” the other that your heart literally sings. When Andi and I get together, we sometimes get so giddy in one another’s presence that we just seem to smile all over and giggle like school girls. It is deLightful to be in her presence. Anyway, with our schedules we rarely get to see one another or even have the opportunity to talk on the phone. So it was wonderful to hear from her by email. In the message she invited me to Yogaville for a weekend workshop that she and Jonathan were giving on Chakra Frequencies and The Divine Name. I had such a wonderful time 2 years ago when they were there before. At first I didn’t think it was something that I could fit into my schedule. But as it got closer to the date, I suddenly felt absolutely sure that it was something I really needed to do. I realized it was on Wesak weekend. I couldn’t imagine being in a better place for the energies of Wesak than with my dear friends Jonathan and Andi at Yogaville. 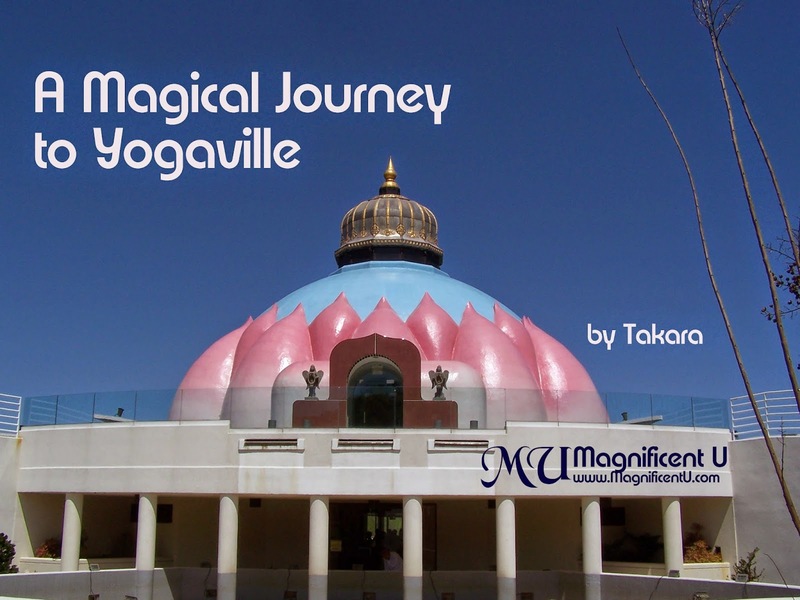 Yogaville is an ashram in the rolling hills of Virginia that was established by Sri Swami Satchadananda. I’m not sure how many acres it covers, but there is a lovely main courtyard with buildings all around that include housing from private rooms to those that are shared, a bookstore, a library, administrative offices, numerous meeting and yoga rooms, and a large facility for shared meals and evening presentations. A bit away from this complex is the famous Lotus Light Shine which is an architectural marvel that looks literally like a Lotus. I arrived on Friday and checked into my room. I ended up in a room with 2 bunk beds and a shared bath across the hall. Two other ladies shared the room with me. They were both attending a different workshop so I rarely saw them throughout the weekend. The workshop was beautiful, engaging, and uplifting. I love moving energy with my voice and Jonathan and Andi are so wonderful at teaching people how to do that. The energies build all weekend until everyone is totally buzzing with energy by the time its over on Sunday. When I attended the workshop 2 years ago, I quickly developed a friendship with a woman from North Carolina who was also taking Andi and Jonathan’s workshop. We spent the entire weekend talking during breaks and walking together to meals and to all the workshop sessions. This time, even though I was in a shared room, and I talked to several people during the meals, I didn’t feel I was really connecting deeply with anyone. It felt kind of odd not really having anyone to share with while I was there. Whenever I am with Jonathan and Andi when they are teaching a workshop, I try to stay very conscientious of their time and attention. I know what its like to keep a workshop going session after session. It takes a lot of energy and focus, so I try not to monopolizing their time. We talk briefly before and after sessions, but typically that’s it. So I was pretty much on my own. By Sunday morning I was beginning to wonder why I had needed to come. The class was wonderful and seeing Jonathan and Andi is always such a blessing. But neither accounted for the intensity of my knowing about my need to be there. I saw Jonathan as I was getting breakfast. I was about to sit down to eat when Jonathan came over and whispered in my ear. He asked me what I was doing at 3 p.m. He and Andi were doing a special ceremony at the Ashram and were only allowed to invite 2 guests to attend. They wanted me to be there. I whispered back that of course I would be wherever they needed me to be at 3 p.m. I’d already checked out of my room and had no plans once the workshop ended around noon. As he walked away, tears welled up in my eyes as I finally understood why I’d been compelled to be there that weekend. At the close of the workshop, Andi introduced me and personally handed samples of the Divine Name Essence out to each of those in attendance. I shared a little about the Dancing Dolphin products and the collaboration Jonathan and I have with the Essence of Sound product line. Several of the people who took the workshop asked me questions about the products during lunch. And I finally felt like I made a new friend that lives pretty close to where I live. One woman suddenly asked me if I ever made gem essences. I told her that I’d made over 70 crystal and gem essences and I was always making something new. She said she had this amazing chimera – a naturally occurring crystal made of ruby, spectrolite, and hemitite – and would love for me to make an essence out of it. I started asking her questions trying to determine how to get the crystal in order to make the essence. It turns out that she had it there at the Ashram. So we went to her room and she handed me the 3 lb. sphere. Here this woman was giving me this outrageous stone to take home with me and I didn’t even know her name. Obviously we exchanged contact information and I wrapped it safely inside a very fluffy beach towel I happened to have in my trunk. I later did a google search and discovered that chimera was only recently found in a remote location in Tibet and is only available in limited quantities. Her sphere is truly a fabulous stone. The day I got it was Wesak. After the ceremony with Jonathan and Andi I took it home and placed it in sacred water to begin the essence creation process. Andi, Jonathan, another friend of theirs and I were met by three of the residents of Yogaville for the ceremony. We entered a special candle-lit room at the Ashram and for the next 2 1/2 hours we sat facing one another toning, singing, humming, sometimes in silence and occasionally giggling. The geometry and acoustics of the room combined with the energies of those present and was enhanced by the energy of Wesak. What was produced was a truly extraordinary, life altering experience. It feels like I’ve jumped a couple of octaves from that experience alone. Whatever happened that day, on all the levels that it happened on, I may never truly understand. I do know that the “tuning” and upgrade I received was necessary in order for me to create the Essence of Oneness you can read about in another post from this month’s newsletter. Wesak and the solar eclipse in May, the lunar eclipse today, the venus transit this week, and summer solstice coming up are all blasting with new energies. Ride the waves and use the energy to go further than you ever have before!